'Front Door Lobby Pick Up/dropoff to all Keystone Restaurants/Skiing from early morning to late evening'. You can also walk to Keystone Village in 5min. 10 min shuttle ride to Mountain House or River Run Gondola. Sts John huge condominium - over 1500 square feet on two levels. Keystone Resorts Manages my property (24hr hotel desk) meaning you have someone who will take care of any of your needs while on vacation (including checking you in and offering Keycards for all members in your party). Fabulous views of Keystone skiing from the deck. Two bedrooms - one large bedroom with king size high end mattress and bunk bed (full/twin and trolley bed)and the other bedroom with King size platform bed. Queen-size sleeper sofa in great room. Very Quiet with bedrooms on opposite ends for guest privacy. Common area spa with huge hot tub, showers and towels, undercover parking, locked ski storage, and elevator takes you within ten feet of room. Easy drive from Denver. One minute off Highway 6 at Keystone. Minutes from great skiing in winter and two golf courses in summer. If you want to get away from the hub bub of Keystone back to back condos, Sts John is hidden in the forest, with great views, and away from the noise. Next to Keystone Convention Center. Use the Keystone Lodge facilities/gym/pool/spa for $10 per day. 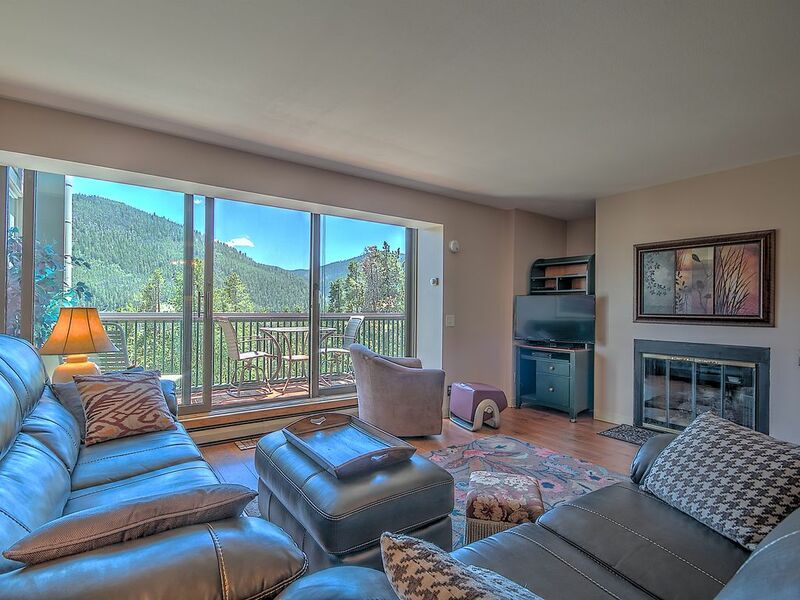 We bought this property because of the space, covered parking, spa, views and easy access to all Keystone has to offer. Easy access to the ski slopes from a large quiet unit. It seems like you are the only person in the building, very seldom hear any noise in the unit. It also seems like there is no one ever in the building, it is very peaceful. The views make you feel like you are in Heaven:). Really enjoy walking down the trail in-front of the building to Lakeside Village for night skating. Keytone bus is a free service that takes you anywhere in Keystone. No worries about going out to dinner and have a couple of cocktails. You have free access to this ride service at no cost. Use of the Keystone Lodge for $10 including 24hr access. Right behind the Keystone Convention center. Short walk to Lakeside Village.